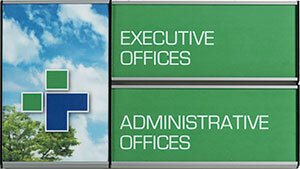 At Clarke, we’ve built our business on a systems approach to signage. You might consider the benefits of that for your business. ADA compatible and available in a wide assortment of standard and custom colors, they can be wall-mounted or ceiling-hung for maximum visibility. The configurations are limitless and the components are interchangeable, making changes a snap! By choosing a preferred sign system and using it regularly, you become even more expert at designing and manufacturing signs. You’ll work more efficiently, lower your labor costs, make effective use of inventory, and begin to recognize potential applications for a variety of different jobs. 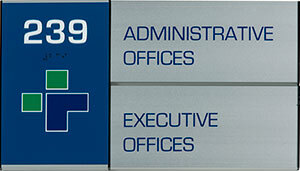 And, you don’t have to re-invent the wheel every time a new buyer comes looking for a directory or office signs. That means faster turnarounds and more satisfaction for your customers. It also makes you a valuable resource when they need coordinated signs to update or add to their original order. The modular systems featured on this website provide the flexibility and changeability required in a fast-paced business environment. Each is easy to build and install. Each provides continuity and adaptability. And, they are environmentally friendly. Simple. Versatile. Comprehensive. Count on Clarke’s systems for the successful sign solutions you and your customers need. 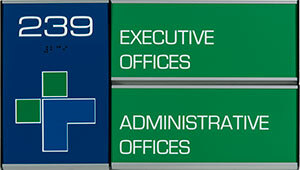 A modular sign system lets the end user take charge of change, from switching out the names of employees in cubicles to the movement of whole departments. Regardless of the configuration, all the sign faceplates – horizontal aluminum bars — fit over sets of clips mounted in an extruded aluminum channel on a wall, with each faceplate height using a different number of clips. The bars can be re-ordered or replaced without having to remove the mountings, saving the cost and time of repairing and painting the wall. The three versions of the Slatz® system feature either applied vinyl graphics and copy or extrusions that enable paper inserts with clear lens cover or engraved rigid media. Interior signs speak volumes about a business. They run the gamut from showcasing service-oriented content to making — or inferring — a statement about a brand or corporate philosophy. Often, they are the front line of communication with visitors, employees and/or buyers. They may represent the ownership of a local store, provide info to hurried customers, or complement the décor to establish the facility’s environment. For all of those reasons, and more, Clarke Systems pays special attention to the quality and design of the interior signs we supply throughout the United States and Canada. Whether you select basic standards or have a concept developed by an interior designer or architect, we can supply a solution that meets the requirements. All of our interior signs – from entry to emergency exit — meet the standards of the Americans with Disabilities Act (ADA) where required and can comply with other standards set by local, regional and professional regulators.